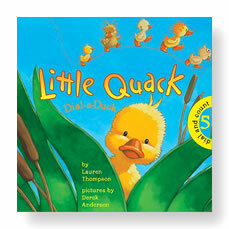 Little Quack's fans will applaud Little Quack: Dial-a-Duck by Lauren Thompson, illus. by Derek Anderson, which replaces the "Quack-u-lator" that ran along the bottom of the hardcover to track the ducklings as they swam to Mama, with an adorable wheel that youngsters can spin to tabulate the number of duck siblings and find the corresponding numeral. Widdle, the courageous duckling who sports a flower and dives in first, is also the first duckling on the "Dial-a-Duck" wheel, while Little Quack, the last to leap, comes at the end. Little ones will dial away the hours with this little gem. And for those who wish to take the downy hero into the tub, Little Quack's Bath Book has waterproof pages, and youngsters can inflate Little Quack on the cover. Copyright 2006 Reed Business Information. Most bath books are simply books printed on vinyl that kids can play with in the tub. Some have extra features like the Tilly Turtle, Dolly Dolphin, Wally Whale and His Friends, and Henry the Helpful Elephant books that lets kids squirt water. This one also has an extra feature—Little Quack can be removed from the front of the book, blown up, and turned into a floating toy. Little Quack's mama calls all her children to come and join her in the water. However, Little Quack is afraid to join his siblings. Eventually he finds the courage to join his mama and the rest of the family in the big pond of water. 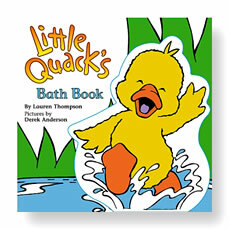 Just like the youngsters who will play with this bath books, they will all enjoy splishing and splashing in the water. 2006, Little Simon/Simon & Schuster, Ages 6 mo. to 3.